Contemporary 2 bed, 2 bath plus den unit in Museum Park's premier full amenity building. North facing and filled with natural light from the floor to ceiling windows. 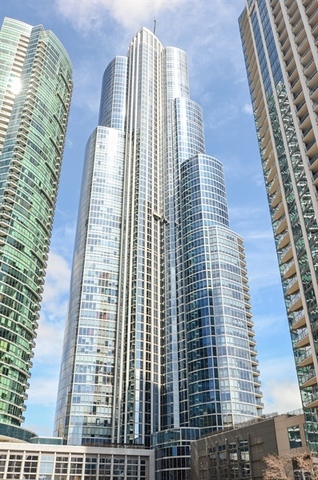 Features a large private balcony and beautiful views in every room of Grant Park, the city skyline, and Lake Michigan. Hardwood floors throughout the spacious living and dining area. The kitchen has dark cabinets, granite countertops and backsplash, SS appliances, and eat-in breakfast bar. The den provides a perfect tucked away office area adding space and function. The master suite has stunning views, WICs, and oversized master bath with separate glass shower and soaking tub. Spacious 2nd bedroom with more views and ample closet space. Freshly painted throughout with chic light fixtures and in-unit W/D. Luxury full amenity building with 24hr doorstaff, indoor and outdoor pools, fitness center, clubroom. Excellent South Loop location near Grant Park, Museum Campus, and the lakefront. Parking space available for $35k. Property information last modified by seller on Monday, May 21, 2018, 05:25 PM CDT. Information Deemed Reliable But Not Guaranteed. Unauthorized duplication, use, or linkage is prohibited. The information on this web site is for personal, non-commercial use and may not be used for any purpose other than to identify prospective properties consumers may be interested in purchasing. Monthly Payment Calculator results are for illustrative purposes only, not a financing opportunity; calculations assume a 30-year fixed-rate mortgage and do not include closing and other costs. Property Tax on NEW properties is estimated at 1.5% of Listing Price for payment calculation purposes; actual value may be higher or lower.